How you, O Athenians, have been affected by my accusers, I cannot tell; but I know that they almost made me forget who I was – so persuasively did they speak; and yet they have hardly uttered a word of truth. – I mean when they said that you should be upon your guard and not allow yourselves to be deceived by the force of my eloquence. unless by the force of eloquence they mean the force of truth; for if such is their meaning, I admit that I am eloquent. But in how diﬀerent way from theirs! not, however, delivered after their manner in a set oration duly ornamented with words and phrases. No, by heaven! at my time of life I ought not to be appearing before you, O men of Athens, in the character of a juvenile orator – let no one expect it of me. – Am I making an unfair request of you? let the speaker speak truly and the judge decide justly. telling of one Socrates, a wise man, who speculated about the heaven above, and searched into the earth beneath, and made the worse appear the better cause. The disseminators of this tale are the accusers whom I dread; for their hearers are apt to fancy that such enquirers do not believe in the existence of the gods. and they were made by them in the days when you were more impressible than you are now – in childhood, or it may have been in youth – and the cause when heard went by default, for there was none to answer. And hardest of all, I do not know and cannot tell the names of my accusers; unless in the chance case of a Comic poet. – all this class of men are most diﬃcult to deal with; for I cannot have them up here, and cross-examine them, and therefore I must simply ﬁght with shadows in my own defence, and argue when there is no one who answers. one recent, the other ancient: and I hope that you will see the propriety of my answering the latter ﬁrst, for these accusations you heard long before the others, and much oftener. Well, then, I must make my defence, and endeavour to clear away in a short time, a slander which has lasted a long time. May I succeed, if to succeed be for my good and yours, or likely to avail me in my cause! The task is not an easy one; I quite understand the nature of it. And so leaving the event with God, in obedience to the law I will now make my defence. I will begin at the beginning, and ask - what is the accusation which has given rise to the slander of me, and in fact has encouraged Meletus to proof this charge against me. Well, what do the slanderers say? and talking a deal of nonsense concerning matters of which I do not pretend to know either much or little – not that I mean to speak disparagingly of any one who is a student of natural philosophy. I should be very sorry if Meletus could bring so grave a charge against me. You hear their answer. And from what they say of this part of the charge you will be able to judge of the truth of the rest. As little foundation is there for the report that I am a teacher, and take money; this accusation has no more truth in it than the other. Although, if a man were really able to instruct mankind, to receive money for giving instruction would, in my opinion, be an honour to him. but as they are human beings, whom are you thinking of placing over them? Is there anyone who understands human and political virtue? Happy is Evenus, I said to myself, if he really has this wisdom, and teaches at such a moderate charge. Had I the same, I should have been very proud and conceited; but the truth is that I have no knowledge of the kind. ’Yes, Socrates, but what is the origin of these accusations which are brought against you; there must have been something strange which you have been doing? whereas the persons of whom I was speaking have a superhuman wisdom which I may fail to describe, because I have it not myself; and he who says that I have, speaks falsely, and is taking away my character. And here, O men of Athens, I must beg you not to interrupt me, even if I seem to say something extravagant. For the word which I will speak is not mine. I will refer you to a witness who is worthy of credit; that witness shall be the God of Delphi – he will tell you about my wisdom, if I have any, and of what sort it is. You must have known Chaerephon; he was early a friend of mine, and also a friend of yours, for he shared in the recent exile of the people, and returned with you. – he asked the oracle to tell him whether anyone was wiser than I was, and the Pythian prophetess answered, that there was no man wiser. but his brother, who is in court, will conﬁrm the truth of what I am saying. Because I am going to explain to you why I have such an evil name. When I heard the answer, I said to myself, What can the god mean? and what is the interpretation of his riddle? for I know that I have no wisdom, small or great. What then can he mean when he says that I am the wisest of men? And yet he is a god, and cannot lie; that would be against his nature. and thereupon I tried to explain to him that he thought himself wise, but was not really wise; and the consequence was that he hated me, and his enmity was shared by several who were present and heard me. – for he knows nothing, and thinks that he knows; I neither know nor think that I know. In this latter particular, then, I seem to have slightly the advantage of him. Then I went to another who had still higher pretensions to wisdom, and my conclusion was exactly the same. Whereupon I made another enemy of him, and of many others besides him. but necessity was laid upon me, – the word of God, I thought, ought to be considered ﬁrst. And I said to myself, Go I must to all who appear to know, and ﬁnd out the meaning of the oracle. I found that the men most in repute were all but the most foolish; and that others less esteemed were really wiser and better. I will tell you the tale of my wanderings and of the ’Herculean’ labours, as I may call them, which I endured only to ﬁnd at last the oracle irrefutable. now you will ﬁnd out that you are more ignorant than they are. Accordingly, I took them some of the most elaborate passages in their own writings, and asked what was the meaning of them – thinking that they would teach me something. I am almost ashamed to confess the truth, but I must say that there is hardly a person present who would not have talked better about their poetry than they did themselves. Then I knew that not by wisdom do poets write poetry, but by a sort of genius and inspiration; they are like diviners or soothsayers who also say many ﬁne things, but do not understand the meaning of them. So I departed, conceiving myself to be superior to them for the same reason that I was superior to the politicians. I was conscious that I knew nothing at all, as I may say, and I was sure that they knew many ﬁne things; and here I was not mistaken, for they did know many things of which I was ignorant, and in this they certainly were wiser than I was. and I made answer to myself and to the oracle that I was better oﬀ as I was. This inquisition has led to my having many enemies of the worst and most dangerous kind, and has given occasion also to many calumnies. 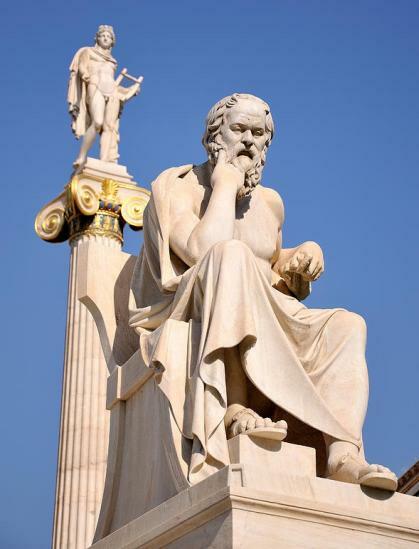 he is not speaking of Socrates, he is only using my name by way of illustration, as if he said, He, O men, is the wisest, who, like Socrates, knows that his wisdom is in truth worth nothing. and my occupation quite absorbs me, and I have no time to give either to any public matter of interest or to any concern of my own, but I am in utter poverty by reason of my devotion to the god. and then those who are examined by them instead of being angry with themselves are angry with me: This confounded Socrates, they say; this villainous misleader of youth! and as they are numerous and ambitious and energetic, and are drawn up in battle array and have persuasive tongues, they have ﬁlled your ears with their loud and inveterate calumnies. and as I said at the beginning, I cannot expect to get rid of such a mass of calumny all in a moment. And this, O men of Athens, is the truth and the whole truth; I have concealed nothing, I have dissembled nothing. And yet, I know that my plainness of speech makes them hate me, and what is their hatred but a proof that I am speaking the truth? – Hence has arisen the prejudice against me; and this is the reason of it, as you will ﬁnd out either in this or in any future enquiry.